Implements feature hashing, aka the hashing trick. This class turns sequences of symbolic feature names (strings) into scipy.sparse matrices, using a hash function to compute the matrix column corresponding to a name. The hash function employed is the signed 32-bit version of Murmurhash3. Feature names of type byte string are used as-is. Unicode strings are converted to UTF-8 first, but no Unicode normalization is done. Feature values must be (finite) numbers. This class is a low-memory alternative to DictVectorizer and CountVectorizer, intended for large-scale (online) learning and situations where memory is tight, e.g. when running prediction code on embedded devices. Either “dict” (the default) to accept dictionaries over (feature_name, value); “pair” to accept pairs of (feature_name, value); or “string” to accept single strings. feature_name should be a string, while value should be a number. In the case of “string”, a value of 1 is implied. The feature_name is hashed to find the appropriate column for the feature. The value’s sign might be flipped in the output (but see non_negative, below). The type of feature values. 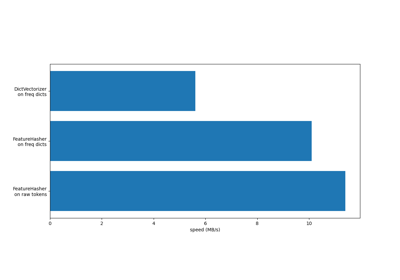 Passed to scipy.sparse matrix constructors as the dtype argument. Do not set this to bool, np.boolean or any unsigned integer type. vectorizes string-valued features using a hash table. transform(raw_X) Transform a sequence of instances to a scipy.sparse matrix. This method doesn’t do anything. It exists purely for compatibility with the scikit-learn transformer API. Transform a sequence of instances to a scipy.sparse matrix. Samples. Each sample must be iterable an (e.g., a list or tuple) containing/generating feature names (and optionally values, see the input_type constructor argument) which will be hashed. raw_X need not support the len function, so it can be the result of a generator; n_samples is determined on the fly. Feature matrix, for use with estimators or further transformers.